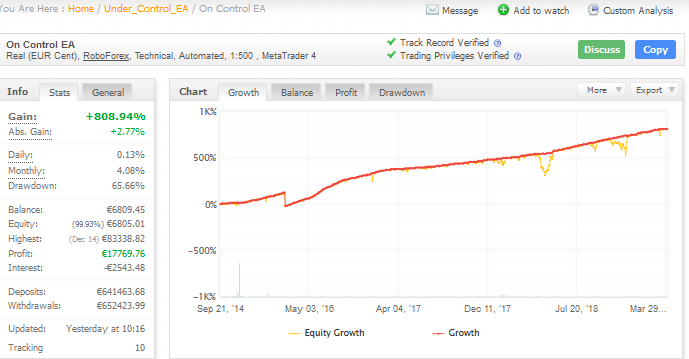 On Control EA probably has the most simplistic website that capitalizes more on their software’s achievements through pictorial links to Myfxbook accounts and less on meaningful company information. For instance, while you would expect the official website to have detailed information about the forex robot, as well as, its developers; On Control Forex EA doesn’t provide its prospective users with such information. Understanding the trading strategy used by an expert advisor plays a key role in informing a trader’s decision on whether to buy the EA or not. But On Control EA website administrators are quite sketchy in highlighting the trading strategy used by their system. The only reference they make to a strategy is by claiming to have the “Final Solution” that guarantees weekly profits in trading with Gold, referring to it as the strategy that tilts market conditions to your advantage. Their website goes on to explain the different basic features of the trading system. Like the fact that it can work on all types of forex accounts and that it bonds well with any broker operating on the MT4 platform. It also mentions that they operate with the 4 and 5 points after the decimal point and that their system is fully automated. While the details on decimal points and full automation are informative, the website just glosses over all the important details. For instance, it makes no reference to the risk management policy adopted by the trading system such as the use of stop loss and guaranteed stop loss (or lack of it). On Control EA isn’t just stingy in providing crucial information about their system’s trading strategy. It also doesn’t provide results for their systems backtests. And in the absence of these backtests, most legit forex trading robot providers will either allow for a free trial period, where users familiarize themselves with the system or extend their license to cover Demo accounts. In addition to a 30- or 60-day money back guarantee, no questions asked. 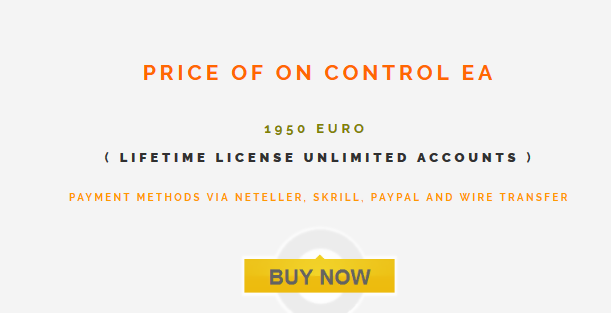 But On Control EA offers neither of this for their €1950 trading software. 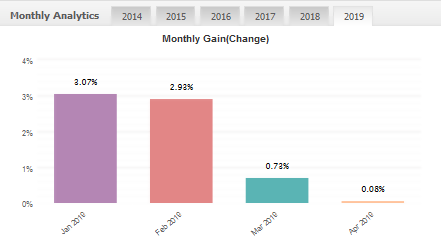 Despite the mystery surrounding the trading system and its developer’s one can’t help but appreciate the level of transparency they have exhibited by maintaining the trading history of their real account on Myfxbook. 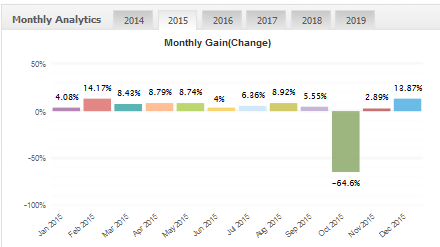 Created on September 2014, the €641,463 account currently reports an absolute gain of +2.77% and a maximum drawdown of 65.66%. This translates to a daily and monthly gain of 4.08% and 0.13% respectively. On Control EA website claims that their trading system supports copy trading. The website administrators mention that while they forward trade settings and system updates to their traders regularly, subscribers are free to copy successful settings on the MT5 trading platform and replicate them in their trades. The upside to this is that it allows even beginners to execute profitable trades and speed up their mastery of forex trading. The European and North American forex markets are heavily regulated. This doesn’t just make them hostile to most forex trading platforms but also limits their citizen’s access to the international market. Different brokers and robot trading system developers have however come up with a workaround around to these policies that involve the use of free and premium VPS. On Control EA is VPS friendly and thus helps more citizens of the world access global forex markets. Why you should not buy this trader? Having been actively involved in the forex industry for such a long time and being privy to how most scams operate, we are positive that you are more likely to lose money when dealing with a ghost forex industry operative than when dealing with a known trader. The reasoning behind staying anonymous after developing what you consider a profit-guarantee project further baffle’s us. Dealing with a trading system developer that is bent on maintaining secrecy around their identity or the company sponsoring their system is, therefore, quite suspicious. On Control EA website claims that their mathematics experts have put together a fully automated and “ultra-high sped trade system” with a “very serious” approach to trading. The results from the trading account histories posted on Myfxbook are however a far cry from these insinuations. Otherwise, how can one explain the huge drawdowns and negative balances reported by the trading system? At one time, it reported a 64.6% loss in a single month. We hold the opinion that the value of an expert adviser should be commensurate to its performance. It, therefore, doesn’t make economic sense to buy an expert advisor that’s struggling to keep its monthly gain above 4% for €1950. Not when there are loads of other free and lowly-priced expert advisors that achieve similar results. On Control EA live trading history shows that the company has been actively involved in the forex industry for close to five years. There is however no independently verifiable honest reviews about their trading system’s performance. Even though they maintain company profiles on reputable forex trading review sites, there are no user reviews advocating for or discouraging the use of their tool. Such a red flag should always be interpreted as a cautious message to any enthusiast trader actively searching for a robot trader. 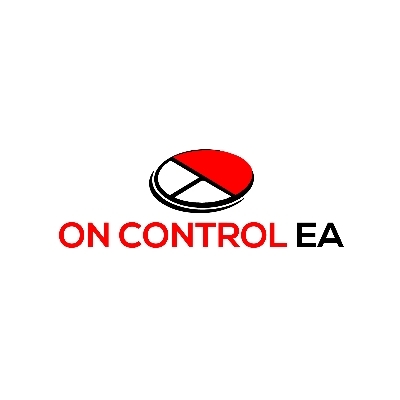 There are a lot of red flags within the On Control EA website starting with their decision to maintain almost all the useful information about the expert adviser and its developer’s secret. They don’t tell us about the strategy used, their risk management plan, or even the EA promoters. Were it not for the clean trading history of their real account on Myfxbook. We would have quickly dismissed them as a scam. And we don’t recommend that you purchase their overpriced system either. For this, we award them a score of 3 out of the possible 10. Previous PostOdin Forex Robot Review: Is The Automated Trader Legit Or Scam?